BlackEarth Minerals NL (ASX:BEM) today provided an Exploration Target for the Maniry Graphite Project in Southern Madagascar. 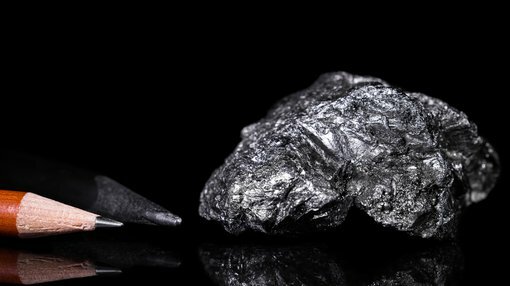 A review of all available data has highlighted the project to have an Exploration Target of 260-380Mt at 6-8% Total Graphitic Carbon (TGC). The estimation was undertaken by extrapolating the recently defined resource at Razafy, utilising the information gathered by the historical mapping and rock chipping and observations from a historical VTEM survey flown in 2008. The Maniry Project has been broken down into three regional domains of graphite mineralisation — the Razafy Domain, the Ivan Domain, and the Haja Domain. The three domains have a total Resource Target for the Maniry Project of 260 - 380Mt at 6-8% TGC. BEM make note that these Exploration Targets are not JORC compliant Mineral Resources and that there is no certainty that further exploration work will result in the determination of a Mineral Resource. The Razafy Domain is a large-scale fold on the north and eastern margins of the Maniry area characterised by multiple high-grade lenses such as the recently defined Razafy and Razafy East Lenses. 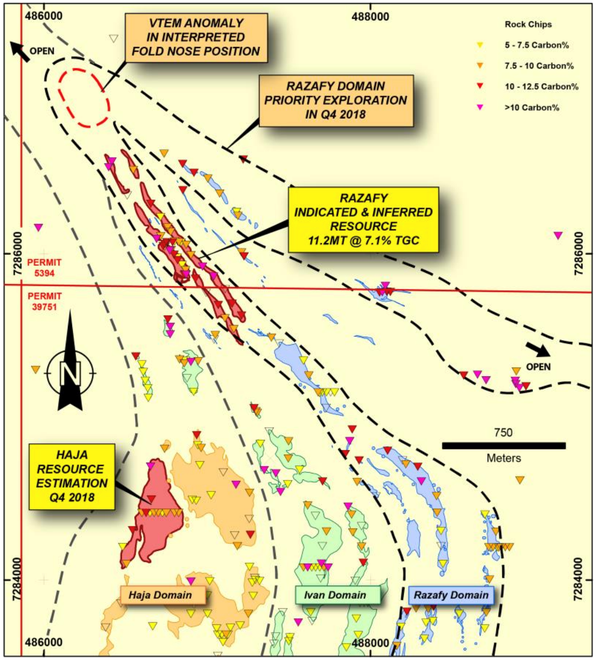 The data review highlighted the Razafy Domain as a priority for exploration in the fourth quarter with the ultimate aim of defining further high-grade resources proximally to the high grade Razafy Deposit. The Exploration Target for this domain, including the Razafy lens, is 85 - 125Mt at 7- 8% TGC. Upcoming exploration will attempt to delineate further high-grade mineralisation proximal to the Razafy Deposit. A review of exploration data sets has further highlighted the Razafy Domain as a priority area for further exploration with the aim of delineating further high-grade resources proximally to Razafy Resource. 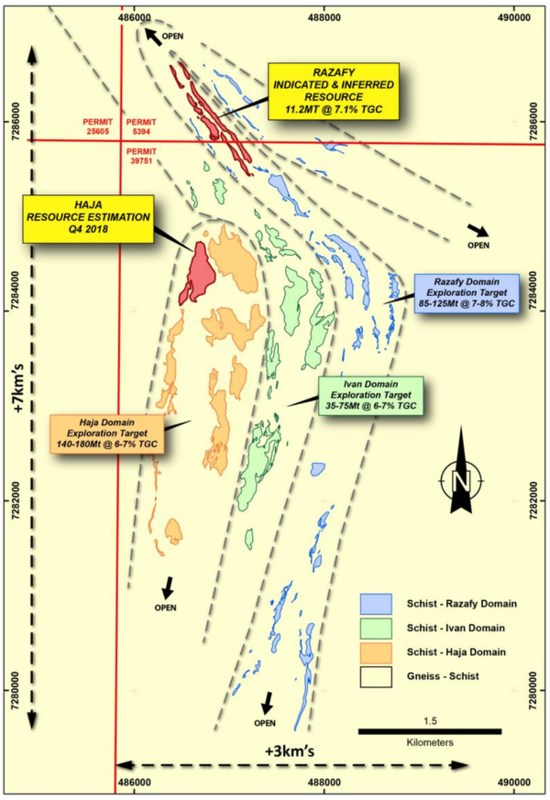 VTEM data, which was collected by the former project owner Malagasy Minerals Ltd in 2008 for nickel-copper sulphide exploration, along with mapping and rock chipping has been used to identify a large-scale fold that will provide the focus of a combined mapping, rock chipping and trenching program in the fourth quarter. Of particular interest, a large, prevalent VTEM anomaly is situated in an interpreted fold nose position. Fold noses are well known structural positions for high grade graphite mineralisation, an example of this would be the Molo Graphite Deposit (Next Source Materials – 141Mt at 6.1% TGC) situated 65 kilometres north of the Maniry Project. BEM’s second graphite project in Madagascar, The Ianapera Project, is located along strike of Molo, exploration will also be undertaken here in Q4 2018. The Haja Domain is characterised by a large-scale fold of the graphitic schist on the western side of the Maniry Project. The domain contains the Haja lens in the interpreted fold nose position, theoretically a position for higher grade mineralisation. This prospect is currently being systematically drill tested, with a JORC compliant resource estimation due in Q4 2018. The Exploration Target for this domain, including the Haja lens, is 140 -180Mt at 6-7% TGC. BEM also provided an update of the 2000m drilling program at the Haja Prospect where 23 of the 25 planned drill holes have been completed. Drilling is progressing well and is expected to be completed within the coming days with a maiden resource estimation in the fourth quarter of 2018. Previous drilling at the Haja Prospect has identified extensive thicknesses of graphite mineralisation including intersections of 70m at 5.3% Total Graphitic Carbon. The Ivan Domain is located centrally at Maniry. The Domain is characterised by large scale, outcropping graphitic schist’s containing localised folding which appears to have provided localised areas of high grade mineralisation within the broader lens. The Exploration Target for this domain is 35-75Mt at 6-7% TGC.